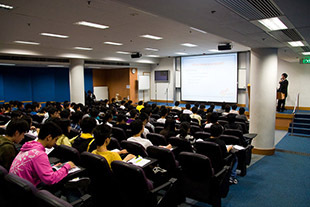 The Hong Kong Joint School Electronics and Computer Society (香港聯校電子及電腦學會) is a non-profit student organization that aims at stimulating public interest in the aspect of electronics and computer technology. Since its official establishment in 1979, the Society has become one of the most influential student organizations in Hong Kong. Despite the fact that the Society is wholly composed of secondary school students, our ability in organizing large-scale functions cannot be overlooked. With undying support from over 60 member schools, HKJSECS has held over 20 successful annual exhibitions, each year with its own theme based on the idea of promoting the use of IT and computers to primary and secondary school students. At its prime, the number of visitors was estimated at up to 50,000. HKJSECS is a registered non-profit making organization established on November 21, 1979. It was established by a group of enthusiastic teachers and students. All Executive Committee and Sub-committee members of HKJSECS are elected from local secondary school student representatives. They are then responsible for organizing all of the HKJSECS activities, which in turn become services beneficial to students. As a registered non-profit making organization, we always target at stimulating the students' interest in electronics and computer technology. Besides, we aim at promoting friendship and coordination amongst students. One of our main activities is the annual Joint School Electronics and Computer Exhibition, from which students and the public can understand the importance of the application of electronics and computer in Hong Kong today. Being a student organization, IT education is one of our main focuses. In recent years, we have made the HKCEE CIT/HKDSE ICT Seminar a regular event, providing students with pre-examination tips and useful information free of charge. Software courses and workshops are also on the Society's regular agenda.